For other uses of "Guitarrón", see Guitarrón. A close-up of a guitarrón being played. 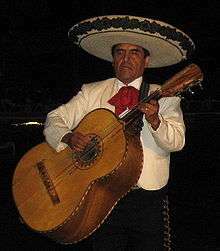 A guitarrón player in a Mariachi uniform. A Mexican guitarrón player in a traditional Mariachi uniform. The guitarrón mexicano (the Spanish name of a "big Mexican guitar", the suffix "-ón" being a Spanish augmentative) or Mexican guitarron is a very large, deep-bodied Mexican six-string acoustic bass played traditionally in mariachi groups. Although similar to the guitar, it is not a derivative of that instrument, but was independently developed from the sixteenth-century Spanish bajo de uña ("fingernail[-plucked] bass"). Because its great size gives it volume, it does not require electric amplification for performances in small venues. The guitarrón is fretless with heavy gauge strings, most commonly nylon for the high three and wound metal for the low three. The guitarrón is usually played by doubling notes at the octave, a practice facilitated by the standard guitarrón tuning A1 D2 G2 C3 E3 A3. Sometimes the high A is lowered an octave, putting it just one octave above the low A. The guitarrón is used in Mexican mariachi groups, which usually consist of at least two violins, two trumpets, one Spanish guitar, and a vihuela (a high-pitched, five-string guitar-type instrument), and the guitarrón. A strap is usually used to keep the instrument up and playable. The guitarrón is the principal rhythm instrument in the mariachi group, and keeps the other instruments together on beat. 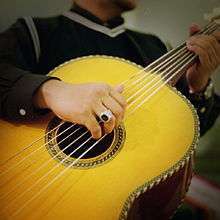 Guitarrón players need good left-hand strength to stop the heavy strings of the instrument and a strong right hand, specifically the index, middle finger, and thumb, to pluck two of the strings (usually a metal and a nylon string). The guitarrón is played by Roy Estrada on the 1966 Mothers of Invention album Freak Out!. Randy Meisner of the Eagles also plays the guitarrón on the track "New Kid In Town" from the album Hotel California (1976; in the credits the name of the instrument is anglicized to "guitarone"). One American player using the guitarrón in a non-traditional context is Aaron Goldsmith, formerly of the New York-based multicultural acoustic ensemble Luminescent Orchestrii; he uses a modified guitarrón with an elongated neck that allows him to play melodically. Another American innovator, Jason Krivo Flores, uses the traditionally tuned Mexican guitarrón in the groups Vagabond Opera (www.vagabondopera.com) and Saloon Ensemble. He can also be heard on Hunter Payes' recording "Dualities Dillemma" where he played guitarrón on the title track. He has also performed with the 1920s Jazz group Trashcan Joe. Played by Simon Edwards, the guitarrón was a defining element of the 1980s British folk-pop band Fairground Attraction. The back of the guitarrón is made of two pieces of wood that are set at an angle making the back shaped like a shallow letter V. This design feature increases the depth and overall size of the instrument. ↑ "Ernie Ball Music Man Company History". Music-man.com. Retrieved 2013-03-23. ↑ "Liner Notes - Hotel California (The Eagles)". Glennfreyonline.com. Retrieved 2013-03-23.